The crater created by an impact is determined by the type of shock wave generated by the projectile. Impacts on solid surfaces go through stages of compression, excavation and modification (Melosh, 1989). During the compression stage, the projectile is destroyed and most of its kinetic energy is transferred to the point of impact. 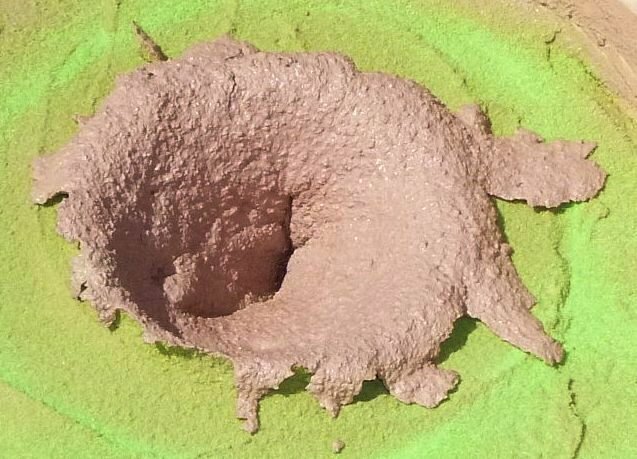 In the excavation stage, a hemispherical shock wave expands from the point of impact and creates a bowl-shaped crater. At the hyperspeeds of extraterrestrial impacts, which vary from 14 km/sec for asteroids to 45 km/sec for comets, the transfer of kinetic energy during the compression stage is virtually instantaneous and even moderately oblique impacts create hemispherical shock waves and bowl-shaped craters. The modification stage is controlled mainly by gravitational forces that determine the final configuration of the crater. The collision of a projectile with a viscous medium at speeds of less than 4 km/sec usually does not destroy the projectile. The excavation stage starts as the impactor travels through the medium creating a conical shock wave until it is stopped by friction. A viscous surface with low elasticity will retain the conical shape, and it will gradually be modified by gravity. Ammunition is frequently tested on ballistic gelatin targets which are viscous but also elastic. Ballistic gelatin is made by dissolving gelatin powder in water so that it closely resembles the density and viscosity of human and animal muscle tissue. Hollow point bullets that shatter on impact create complex trails in the gelatin. Bullets that retain their integrity form conical cavities that quickly collapse due to the elasticity of the gelatin. High-speed photographs of bullet trajectories through gelatin often reveal irregular cavitation caused by the spin or tumbling of the bullets. 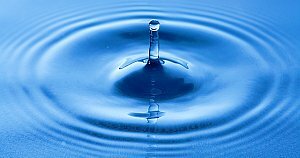 Small impacts on water illustrate the elasticity of the surface and the effect of surface tension in a medium of low viscosity. The elasticity is due in part to the force of gravity which tends to create a level surface. When a projectile penetrates the water surface, it creates a cavity. The impact generates a circular shock wave and the displaced water forms a crown-shaped ejecta curtain. The formation of the cavity creates a region of low pressure. 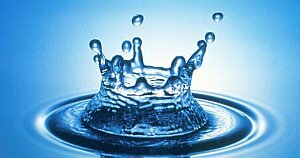 The centripetal rush of water collides at the center of the cavity and forms a rising column of water. When the column collapses back unto the surface, a secondary cavity is formed which repeats the process, each time with less intensity. The oscillation forms concentric ripples typical of elastic deformation of Newtonian fluids under the force of gravity. Small spherical droplets form at the extremities of the ejecta curtain where surface tension is the dominant force. The following images illustrate the formation of a conical cavity by the impact of a marble fired with a slingshot at a viscous surface consisting of equal parts of pottery clay and sand with enough water to have the consistency of mortar. 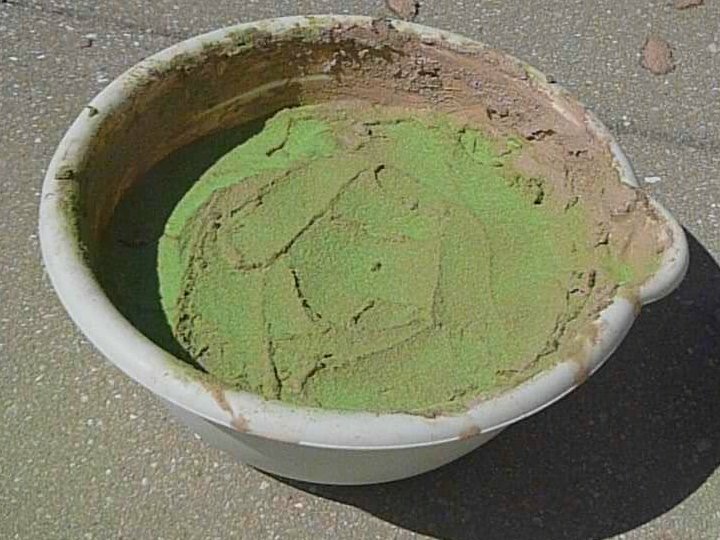 The surface of the target was thinly covered with colored sand to enhance analysis of the images. 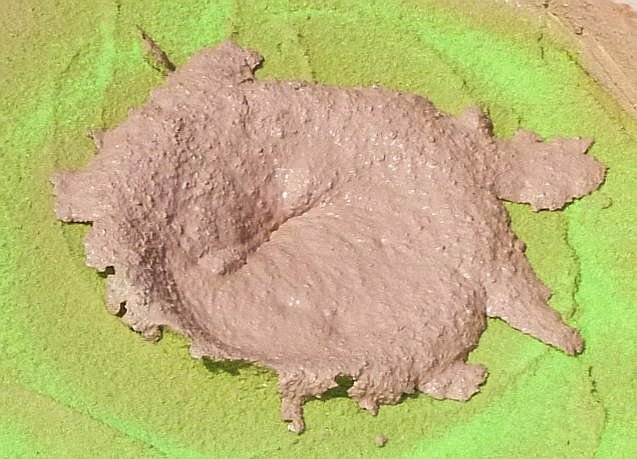 This non-Newtonian thixotropic clay-sand mixture has little elasticity and the material ejected by an impact is not influenced by surface tension. 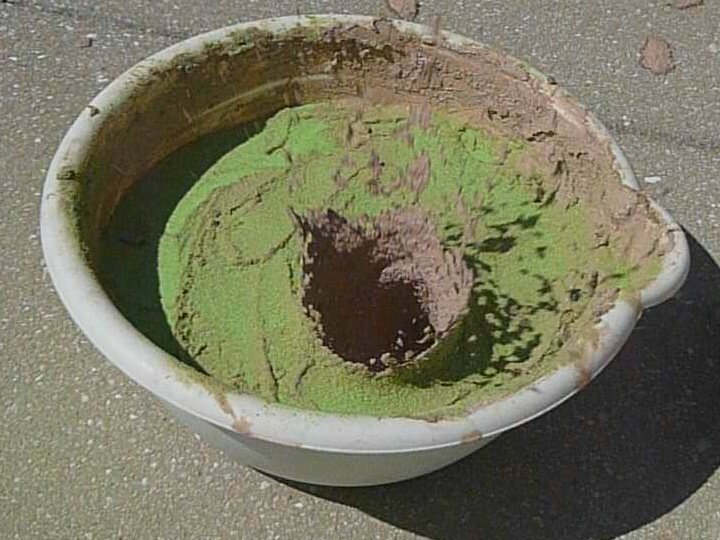 Impacts on viscous surfaces do not have a clear demarcation between the compression stage and excavation stage since the projectile is not destroyed. Upon impact, the projectile pushes target material out of its path, compressing it and accelerating it, while at the same time the projectile is decelerated by the target's resistance. The penetration of the projectile causes displacement of material that forms an expanding ejecta curtain. 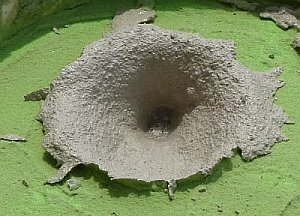 In the image above, a portion of the projectile can be seen at the bottom of the conical cavity when the cavity reaches the point of maximum excavation. Under the influence of gravity, some of the ejected surface material follows parabolic trajectories while material at the edge of the cavity starts to form an overturned flap. The start of the modification stage consists of an elastic rebound that decreases the size of the cavity and buries the projectile. 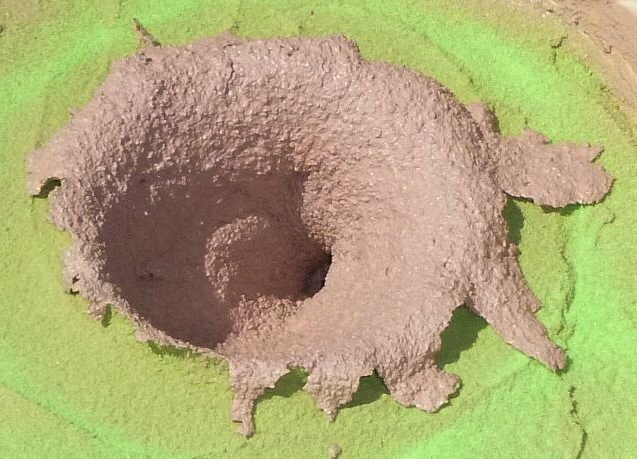 The final elastic modification occurs while the last of the ejected material is still in flight approximately one crater diameter from the point of impact. The resulting conical cavity becomes relatively stable after all the kinetic energy of the impact has been dissipated. At this point, gravity becomes the major force acting on the cavity, and modification will continue more slowly through topographic relaxation. Topographic relaxation is a plastic deformation process driven by gravity that tends to smooth out geological features by making hills less prominent and valleys less deep. The process is generally slow, but it can be speeded up by reducing the friction within the medium, usually by vibrations that promote liquefaction. Gravity causes viscous flow that reduces the depth of an impact cavity from the bottom up, essentially reversing the sequence in which the cavity was formed. The modification of the cavity continues until the lateral centripetal flow of material cannot overcome the force of friction. In the final configuration, a shallow depression is surrounded by an elevated rim made of the overturned flap created by the impact. Over time, water will seep into the cavity creating a pond. This process has been proposed for the formation of the Carolina Bays. 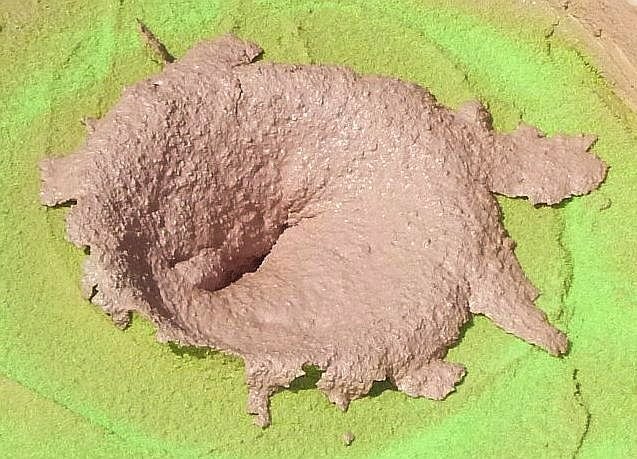 Melosh, H.J., 1989, "Impact Cratering: A Geologic Process"